Oakley Brooks is a contributor to Writers on the Range, a service of High Country News (hcn.org). He lives in Portland, Oregon, and is the author of Tsunami Alert: Beating Asia's Next Big One, published last year in Singapore and forthcoming in the United States. The most important image from the disaster that rocked Japan last month might be one that was never captured by anyone's camera. It has to be conjured up from words: The mayor of a town on the Sanriku coast north of Sendai races to the top of the three-story city hall to escape the tsunami that follows just 30 minutes after the earthquake. Then the giant wave rolls over the official building and sweeps away most of the other 30 people there. The mayor narrowly avoids death by clinging to a steel fence, but his story about what happened raises the question: Were he and his countrymen too complacent? "I thought they were prepared," says Rob Witter, an Oregon coastal geologist. He's spearheading a tsunami-mapping project to prepare for the Pacific Northwest's own eventual great earthquake and potential 100-foot waves. He thought Japan knew what it was doing. 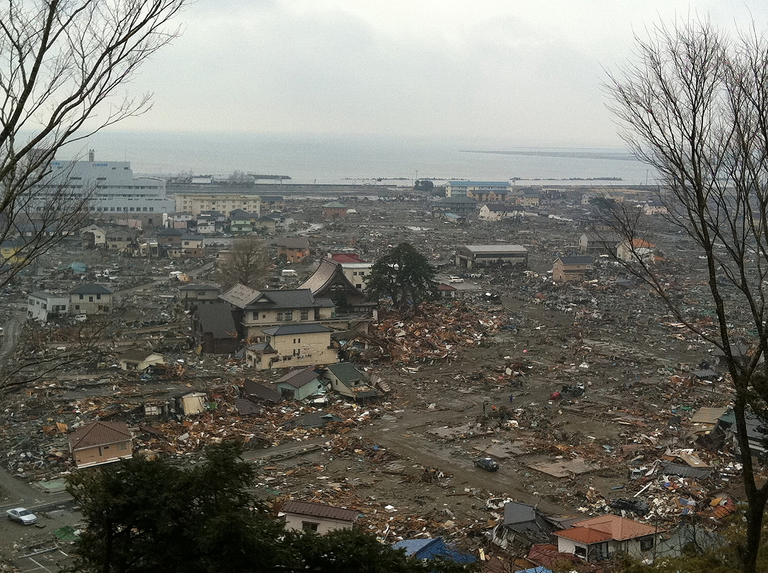 A view of Ishinomaki, on March 26, 2011, two weeks after the Japan earthquake and tsunami. The disaster is as puzzling as it is overwhelming. Japan -- the country that invented the word "tsunanmi" -- is steeped in the history of the great waves, having recorded quakes in minute detail as far back as 684. The country now spends more than any other nation on seismic research and instruments, in part to aid its tsunami warnings, which a Japanese seismologist once proudly told me can be issued as soon as a minute after an earthquake. The Sanriku coastal communities of northeastern Japan are known for their diligence in commemorating tsunamis; every year, residents pilgrimage to monuments that mark the extent of historical flooding. The local communities maintain buffer spaces lined with trees to break the waves. And the government has sponsored construction of tall protective seawalls and floodgates at river mouths, to complement the early-warning system. But at the same time, some reports in recent years indicate that complacency has been spreading among residents on the coast. Sitting behind their network of defenses, many people have chosen not to evacuate after big quakes in the past. Some people have even become fixated on staying in order to see tsunamis hit the coast, hoping to witness the drama up close. To compound the problem, some scientists and planners greatly underestimated the size of a worst-case tsunami off Sanriku. Making matters still worse, there's evidence that the power outages that followed the earthquake left tsunami alarms silent. Here in the Pacific Northwest, it should already be clear that warning systems are not a panacea. Our own system offers a solid alert for distant tsunamis coming from places like Japan, but it isn't effective for quick-arriving waves like those expected from the nearby Cascadia fault. Given Japan's experience last month, it is clear that national and regional officials need to step up their campaign to tell people to evacuate without hesitation when a big earthquake strikes. And everyone -- even the casual tourist at the coast -- needs to understand the danger. Visitors make up at least half of the 90,000 people living, working and traveling through Oregon's tsunami zone every day, and another 85,000 are in Washington's vulnerable zone. In Oregon, Rob Witter and his colleagues struggle to clarify the evacuation message and establish safe escape routes. Even with new federal funding after the 2004 Indian Ocean tsunami, "We're running a bare-bones crew of mostly geologists," Witter says. "I'm six months behind on making (flood) maps. We need professional educators and psychologists and people who understand social issues." Fortunately, volunteers and communities are getting involved; if we are to build a tsunami-resilient culture in the Northwest, it will have to take root beyond the realm of today's impoverished government. In Nehalem Bay, Ore., where whole towns sit on sea-level sand, a small army of volunteer block-captains is training in radio skills, first aid, and shelter and food supply, just in case disaster strikes and the place is cut off for weeks. The Huu-ay-aht people on Vancouver Island's West Coast have revived their ancestors' stories about the last Cascadia Big One, in 1700. The tsunami that followed swept tribal members out to sea. Only those on high ground survived. Those stories have spurred the construction of new tribal offices and community spaces on elevated ground. Surfers and artists and fishermen will need to step up their own cultural contribution. Whatever local knowledge develops, it needs to be continually re-invigorated to sustain awareness. A deeper knowledge about tsunamis has helped before, even in Sanriku, Japan. In 1700, when the last big Cascadia quake sent killer waves across the sea to Japan, some people in Sanriku realized the significance of the strange recession of the sea and got out of the way. Now, the lessons about the danger facing Japan and our West Coast will have to be learned all over again.